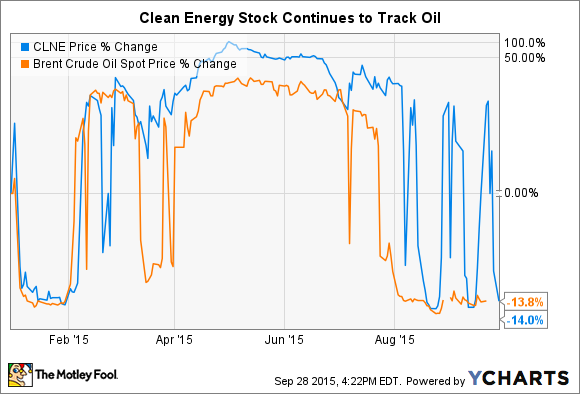 Nothing specific to Clean Energy to report today, but there's big-picture momentum driving the stock down. What: Shares of natural gas refueler Clean Energy Fuels Corp. (NASDAQ:CLNE) fell 10.8% today. This is a continuation of big swings for the company's stock, which has been everywhere from $4-and-change to above $10 and now back to around $4.30. Why has the stock moved so much with the price of oil? In short, because oil is the competition -- or at least gasoline and diesel are, and the cost of oil largely drives prices. And since natural gas-powered automobiles, trucks, and heavy-duty vehicles cost more than their gas and diesel brethren, that fuel cost-savings is critical to Clean Energy's business. Now what: Yes -- natural gas has lost a lot of its pricing advantage over the past year or so, but natural gas prices are also significantly down over the same period. And while natural gas has higher fixed "at the pump" costs than gas or diesel, ultra-cheap wholesale prices for NG has helped Clean Energy stay competitive, and not have to pass along too much of its margins to do so. At least so far. But even with that in consideration, cost isn't the only factor, though it is a very big one, for fleet operators, and the companies that employ them, and natural gas' status as a much cleaner fuel at the tailpipe has helped drive growth, even in the current cheap oil environment. Looking at the bigger picture, the company continues to grow fuel sales and sign up new fleet customers, and cheap oil isn't going to drive companies to abandon their existing NGV fleets. Yes -- there's a chance that growth may slow some over the next several quarters, if potential NG customers hold off on making the switch just yet, but so far the fundamentals of Clean Energy's business have continued to steadily improve. And that's likely to continue, even in the face of a protracted cheap-oil environment.